Are you upgrading from Windows XP to Windows 7 or buying a new PC? In both cases, you face the same tedious chore: reinstalling all your apps. That means digging out a bunch of CDs and/or downloading programs from various sites, then installing them one at a time. I don't know about you, but I can think of better ways to spend several hours. 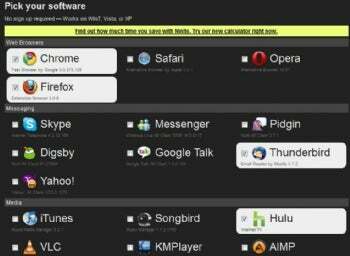 Ninite creates a custom software installer with all the freeware and open-source apps you want. Just choose from the dozens of available programs--everything from AVG Free Anti-Virus and Dropbox to OpenOffice and uTorrent--and the service builds an installer that will download and load them all. Once you start the installer, you can sit back and relax: Ninite automates the entire process, meaning you don't have to sit around clicking Next a bunch of times. Even better, Ninite automatically chooses the proper version of each program--32- or 64-bit--and eliminates any toolbars that might try to sneak in during installation. I love this thing. I've used it several times on new PCs, and it saves time like you wouldn't believe. Bookmark it!